Comprising substantial essays written by leading scholars, this companion constitutes an exceptionally broad-ranging and in-depth guide to one of America's greatest poets. 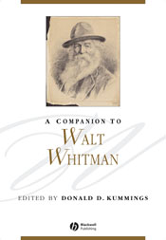 Makes the best and most up-to-date thinking on Whitman available to students. Designed to make readers more aware of the social and cultural contexts of Whitman's work, and of the experimental nature of his writing. Includes contributions devoted to specific poetry and prose works, and a compact biography of the poet.